For a complete beginner it’s easier to work out. You go to a list of courses and start with the first one. However where to start in freediving depends a lot on your confidence level as there are two places to start. You can either start with a Try Freediving Course or straight away with the RAID Freediver Course. If you do the Try Freediving Course then you’ll need to do the RAID course before you can dive in open water or join the open water part of our club. However, taking the RAID Freediver Course means you can right away join our club days and take part in our speciality courses and workshops. The tricky part comes when people with no formal freediving qualification but plenty of experience come along and want to take a higher level course or join the club. For insurance, safety and standards reasons, we can’t accept an unqualified freediver on an advanced course or in the club. However it is possible to do a condensed version of the RAID freediver course depending on personal circumstance. The other very important point is that unqualified freedivers often have very unsafe habits and so, without question, they always learn something new on their course! Another great thing about the RAID course and the way that the Go Freediving Instructors teach is that the everything is tailored (within the depth limits of the course) to your individual ability. So the same course can look very different to a diver who is brand new to freediving and one who has been spearfishing for years. How to start freediving with our handy flow chart! If you are wondering how to start freediving or how to progress your freediving skills, this flowchart will guide you through the wide range of levels, courses and skills you can gain as a RAID freediver. 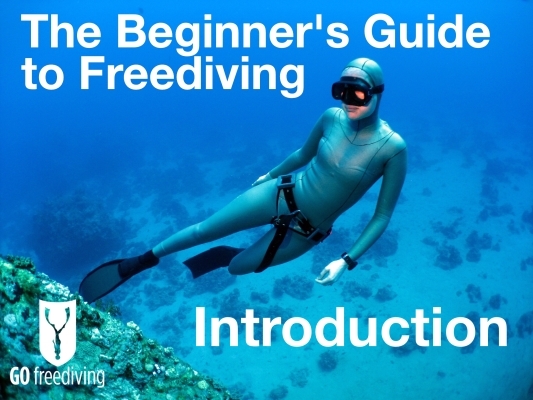 You will find links to all the different courses and our popular Beginner’s guide to freediving below for further reading. We’ve created this guide to help budding Freedivers discover how to start freediving and understand the sport of Freediving. It is also the perfect reference guide for more experienced divers who want to learn a bit more. If you’re wondering how to start freediving, you’ll need help to figure out things like: what course to take; what equipment you need; how understand the physics of freediving; and how to learn and perfect some freediving techniques. The Beginner’s Guide to Freediving is split into 20 parts which you can find below, covering everything a new Freediver could want to know about how to start freediving. Dive in today.